There’s chutzpah and then there’s the deal that Airbus SE just struck with Bombardier Inc. By acquiring a 50 percent stake in Bombardier’s struggling C Series commercial jet program -- for free -- Airbus has handed Boeing Co., its U.S. nemesis, a whopping black eye. Fearing the C Series could let Bombardier become “another Airbus”, Boeing successfully persuaded the Trump administration to slap massive duties on the aircraft, even though it doesn't really offer a similar product. But if Boeing thought Bombardier was going to fall on its sword, boy was it wrong. 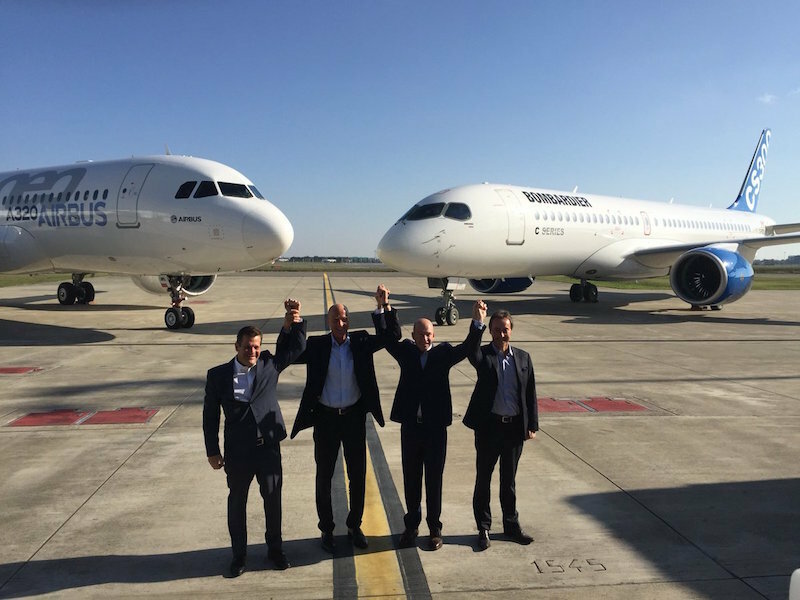 Airbus can now bring to bear the full weight of its international sales, supply chain and maintenance capabilities to the C Series. And by adding a final assembly for the aircraft in Alabama, Airbus might make the Americans think twice about those punitive tariffs (jobs for U.S. workers!). For the European aerospace giant, this deal feels like a slam dunk. Unlike two years ago, when it first toyed with making a C Series investment, the aircraft is now a much less risky proposition. It's been certified by regulators and the first customers seem very pleased with it. True, the program's still consuming cash, but Bombardier is promising to absorb another $700 million in losses after closing. Airbus can’t really lose here. Indeed, by acquiring warrants over 5 percent of Bombardier's stock at the current price, there's potential for considerable upside. Bombardier has lost two-thirds of its value since 2011 amid fears over the future of the C Series. It’s sad that after taking a big risk and sinking $6 billion into an innovative new plane, Bombardier wasn’t ultimately able to deliver it on its own. It has about 350 orders for the C Series, but thinks the market could have appetite for 6,000 small planes of its ilk over 20 years. But Bombardier chief executive Alain Bellemare had a simple question to answer: Is it better to own a larger majority stake in an aircraft program valued at just $2 billion, which hasn’t secured a major order for 18 months; or a minority stake in one with much better prospects? After closing, Bombardier will own 31 percent of the C Series partnership, while Quebec will hold 19 percent. As I argued here yesterday, Bombardier’s finances were arguably too weak to contemplate going it alone, especially with Boeing and the U.S. government trying to suffocate it. Now with Airbus as partner, Bombardier stands a better chance of convincing wavering customers to buy the plane and of making money with it more quickly. Bombardier's goal was to reach cash break-even on the C Series by 2020. In bringing a trade case against Bombardier, Boeing seems to have forgotten the first law of all playground scuffles: if you pick a fight, always be sure to land the knock-out punch. Airbus just delivered it. Click here for the story on the Bloomberg Gadfly website.